We can provide everything you may need to complete your curtain installation. From stock we offer an extensive and comprehensive range of curtain tracks – plastic, metal, uncorded and corded including well known names such as Swish and Integra. 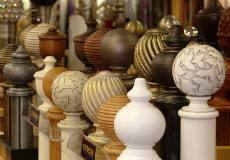 Curtain poles, in various metal and wooden finishes, bay poles, net rods and portiere rods. We can supply a curtain fitting solution however difficult a style of window you may have. We also stock all rufflette hooks and heading products. Tieback hooks and curtain holdbacks.